Have you ever opened up your suitcase after a long airplane ride only to find your pricey comestics—we're talking your lotions, foundations, face washes, etc.—have leaked and spilled onto your clothes? What a waste (and mess, of course). To avoid any such travel hiccups during your upcoming holiday travels, we suggest investing in a good travel makeup bag because not only does it prevent the aforementioned disasters, but it also keeps all of your go-to essentials in one organized place—and easily accessible once you reach your final destination. Now, when shopping for a makeup bag safe for travel, we suggest making sure it has several key design elements. Does it have several different pockets and compartments? Great. Is it water-resistant? Awesome. And last but certainly not least, how is the size? Too large and it won't fit into your suitcase; too small and it won't hold much—but of course, the size also depends on your needs. If you consider yourself a makeup junkie, a bigger bag might be better suited for you. And if you really don't need much more than mascara and blush, then a more compact one should definitely suffice. Ahead, we found all the best (and cutest) travel makeup bags for every budget. Read on to see and shop our picks ahead of your vacations, and say goodbye to any suitcase spills for good. This one has a rating of 4.7 out of 5—pretty great. We love the leather design. There's so much space in this one! A super-roomy cosmetics bag we can't wait to test out. A five-star-rated makeup bag we can't wait to try. A simple pick that holds just the essentials. How cute is this polka-dot pattern? This one is so on trend. This cosmetics bag has rave reviews. A water-resistant material is a must. This one means serious business. Store everything, from makeup to face creams, in this stylish pouch. A simple pouch that can be used to store more than just makeup. We haven't seen a makeup bag like this before. A standout review? "LOVE everything about this bag. The quality, the color, the size. 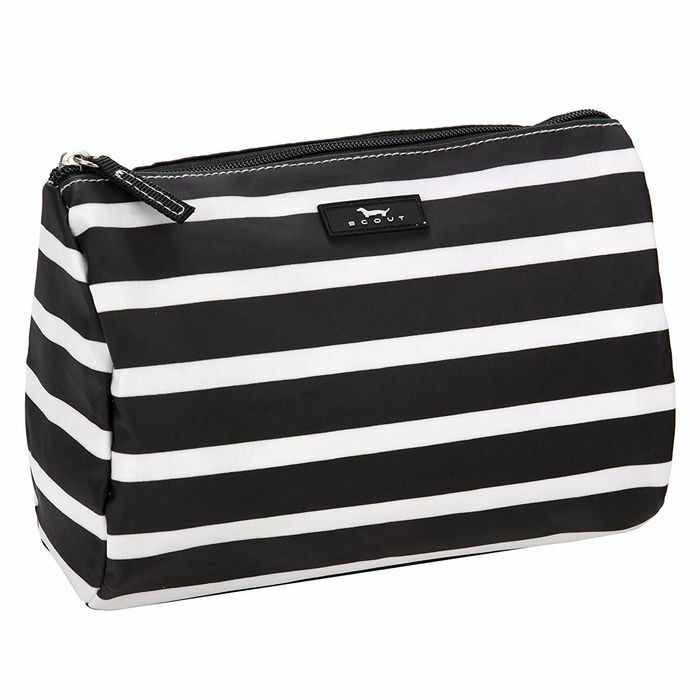 I bought this for a traveling makeup bag and it can hold that plus a lot more." Just wait until you see the inside of this makeup bag. Easily find all your essentials in this see-through bag. We can't resist a rose gold bag. Why buy just one when you can get three? Multiple compartments are a must in a great makeup bag—and this one has many! You won't have any problems fitting this one into your suitcase. A sturdy and durable makeup bag worth the price. According to one review, this bag has "Great capacity! It is actually bigger than what I had expected." Now that's what we like to hear. Next up, shop the best travel shoes, all in one place.